Lineworkers serve on the front lines of our nationâ&#x20AC;&#x2122;s energy needs, and we honor the men and women who work in challenging and oft en dangerous conditi ons to keep the lights on. To recognize your co-opâ&#x20AC;&#x2122;s dedicated employees, #ThankALineworker this April. of nostalgia in the recording industry. Academics studying Lake Erie have found an invaluable, if unexpected, source of data. 34	THESE WALLS CAN TALK Dozens of Ohio post offices contain history lessons on community and American can-do spirit. Cover image on most issues: Union Rural Electric Cooperative crew leader Sean Luellen captured this image of URE line technician Sam Bevis at work in the bucket during a gorgeous autumn day. Lineworker Appreciation Day is April 8. ALWAYS ON DUTY April showers bring out the best in cooperatives. cross the state, Ohio’s electric co-ops invest in new and updated equipment to bring electricity to your home or business on a continuous and uninterrupted basis. Cooperatives engage technological advances to track the performance of our electric distribution networks and to solve problems quickly. We train our staff to be available when you need us and to resolve issues safely and reliably. Today, more than ever, our world is powered by our electric system. Yet, in spite of investments in technology, time, and preparation, Mother Nature still puts us in our place from time to time. The past winter brought an unexpected ice storm to northwestern Ohio, followed by a brutal February windstorm that caused power outages across the state. Now, as the season thaws into spring, we brace ourselves for inevitable thunderstorms, while crossing our fingers to ward against tornadoes. Your electric cooperative is staffed with dedicated employees who respond to each and every event that comes our way. From the member service representatives who take your calls to the engineers and managers who formulate appropriate action plans to the linemen who brave the elements to restore your electric service, each member of the team is committed to the three “R’s” — respond, restore, and reassure. April 8 is Lineworker Appreciation Day, when we recognize the professionals who put themselves in peril to provide the power that energizes us. Even under the best circumstances, line work is a difficult and potentially dangerous job. As recent events remind us, the skills of lineworkers are most crucial when conditions are worst. To do the job effectively and consistently, lineworkers rely on their support systems. Training, obviously, is of utmost importance, and your co-op ensures that lineworkers stay up to date on best practices. The rest of the co-op team is there to be sure that work is dispatched efficiently and that proper materials and equipment are on hand for repairs. They let our members know what to expect. Often overlooked, but perhaps most important, is the pillar of our families, as we respond to routine and emergency calls alike. Electric cooperatives are sometimes compared to a big family — check out page 4 to read about a few Ohio linemen who have taken that to another level … and the next time you turn on a light, thank a lineman. April 8 is Lineworker Appreciation Day, when we recognize the professionals who put themselves in peril to provide the power that energizes us. Ohio Rural Electric Cooperatives 6677 Busch Blvd. Columbus, OH 43229 614-846-5757 memberinteract@ohioec.org www.ohioec.org Patrick O’Loughlin	President & CEO Patrick Higgins	Director of Communications Jeff McCallister	Managing Editor Rebecca Seum	Associate Editor Anita Cook	Graphic Designer Contributors: Brian Albright, Colleen Romick Clark, Victoria Ellwood, W.H. “Chip” Gross, Catherine Murray, James Proffitt, Jamie Rhein, Damaine Vonada, and Kris Wetherbee. 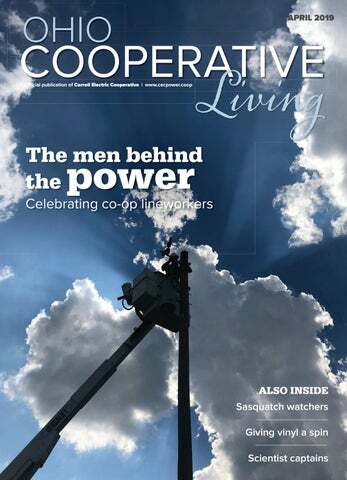 OHIO COOPERATIVE LIVING (USPS 134-760; ISSN 2572-049X) is published monthly by Ohio Rural Elec­tric Co­op­eratives, Inc. It is the official com­mun­ication link be­tween the elec­­­­tric co­operatives in Ohio and West Virginia and their mem­bers. Subscription cost for members ranges from $5.52 to $6.96 per year, paid from equity accruing to the member. Nothing in this publication may be reproduced in any manner without written permission from Ohio Rural Electric Cooperatives, Inc. All rights reserved. FAMILY AFFAIR: Line work is a profession that often sees fathers and sons, or even brothers, follow in each other’s footsteps. SQUATCHER GATHERING: A Salt Fork State Park conference is the epicenter of Ohio’s Bigfoot phenomenon. MIAMISBURG MOUND: The Adena mound near the Great Miami River is one of the nation’s tallest earthworks. FLAVORFUL FUNGUS: High in fiber and vitamin-rich, mushrooms are a healthy and versatile way to enhance any meal. GUERNSEY-MUSKINGUM ELECTRIC: The east-central Ohio co-op counts The Wilds and Ohio’s largest state park among its members. News and important information from your electric cooperative. 28	CO-OP PEOPLE RAMPING IT UP: After a fortuitous find, South Central Power Company members specialize in aromatic agriculture. WHAT’S HAPPENING: April/May events and other things to do. 40	MEMBER INTERACTIVE MUD SEASON: Readers get down and dirty after April showers. Ohio’s Electric Cooperatives is an equal opportunity provider and employer. Dana Springer, Ernie Springer, and Tyler Springer When Dana Springer was a youngster, he and his siblings could hear electric company dispatches come through on a scratchy radio at home when his dad, Ernie, was on call. Ernie, now retired, worked as a lineman and line supervisor for 35 years for Licking Rural Electric Cooperative, now The Energy Cooperative, based in Newark. “We could hear that old radio all night long. But we didn’t mind,” Dana says. In fact, it probably inspired him. Dana went to college for a couple of years and then worked on the family’s 1,000acre farm in eastern Ohio, where they grew corn and soybeans and raised cows and pigs. “Farming wasn’t very profitable in the 1980s, so I sent an application to the coops and started as an apprentice lineman at Union Rural. Now, I’ve been on the line crew for almost 34 years.” His dad, however, hasn’t completely given up the farm. Now retired from the co-op for more than three decades, Ernie still farms about 80 acres, and Dana still helps out during harvest time. o I believe in the existence of Bigfoot, a hair-covered, 8-foot-tall mysterious monster that smells bad and has been rumored to live in remote Ohio woodlands since the mid-1700s? No. No, I don’t. But many people do. So many, in fact, that the Buckeye State has no less than three annual conferences dedicated to Bigfoot believers. Much of the activity takes place in and around Ohio’s largest state park, Salt Fork State Park in Guernsey County near Cambridge. “The Bigfoot page is the most visited section of our website,” says Debbie Robinson, executive director of the Cambridge/Guernsey County Visitors and Convention Bureau. “Our 2019 events calendar includes the annual Ohio Bigfoot Conference, Bigfoot Adventure Weekends, Creature Weekends, and monthly Bigfoot night hikes at the park.” Another name for Bigfoot is Sasquatch, and true believers refer to themselves as “Squatchers.” USA Today even ranked Salt Fork as one of the top 10 “Squatchiest” places in the country. John Hickenbottom, a state naturalist at Salt Fork, coordinates the monthly summer Bigfoot night hikes, which take place during the holiday weekends of Memorial Day, the Fourth of July, and Labor Day. “The hikes have become very popular,” says Hickenbottom, “with anywhere from 150 to 300 people attending each time we hold one. We offer both a family-friendly hike and one for adults only.” Saturday, May 4, will mark the eighth annual Ohio Bigfoot Conference at Salt Fork. Attended by several thousand people including vendors, the official conference is only one day, but activities extend over the entire weekend. Its website says the conference has grown into the world’s premier Bigfoot conference. One of a half-dozen Bigfoot experts and celebrities who spoke at last year’s conference — and who is scheduled to appear again this year — is James “Bobo” Fay. Hailing from California, Fay is best known for his role on the Animal Planet TV show Finding Bigfoot. Fay says he sighted his first Sasquatch in 2001 in northern California and has seen several more in various places across the country. He’s not yet spotted a Sasquatch during his visits to Ohio, but claims to have heard two, both at Salt Fork State Park. GATHERING A carved Bigfoot family tries to look inconspicuous at the Ohio Bigfoot Conference (left); Bigfoot expert Bobo Fay (black shirt) poses for a photo with a fan. Asked why he believes Salt Fork is so “Squatchy,” Fay says that it’s the perfect Bigfoot habitat. “Sasquatch are omnivores, eating both vegetation and preying on other animals, and Salt Fork is a large natural area with plenty of wild foods. It also has a huge white-tailed deer population, which helps a Bigfoot survive the winter.” Bigfoot sightings have been reported from every state except Hawaii and by all demographics. “The number of reports nationally tends to correlate with rainfall totals,” Fay says. “For instance, 95 percent of Bigfoot reports come from areas with at least 20 inches or more of annual rainfall. In desert regions, there are very few sightings, virtually none. So, a Bigfoot sighting is not a cultural phenomenon — it’s a biological phenomenon.” According to Fay, the Ohio Bigfoot Conference is the oldest, biggest, and best-run Bigfoot conference in the country. “It’s a great time and definitely something people should check out,” he says. By the way, Salt Fork State Park is on Guernsey-Muskingum Electric Cooperative lines. Would that make any Bigfoot found living within the park an electric co-op member? For more information, visit www.ohiobigfootconference.org and www. visitguernseycounty.com. W.H. “CHIP” GROSS (whchipgross@gmail.com) is Ohio Cooperative Living’s outdoors editor, and in all his years spent outdoors, he’s not yet spotted a Bigfoot ... but he’s looking! Location: On a 100-foot-high bluff near the Great Miami River in Miamisburg Mound Park. Provenance: Originally measuring 68 feet or more in height, the conically shaped Miamisburg Mound was built by members of the Adena culture, who flourished in what is now southern Ohio from approximately 800 B.C. to 100 B.C. The Adena — and later, the more sophisticated Hopewells — built thousands of earthworks near the Ohio River and its tributaries, and it’s believed that the Miamisburg Mound was constructed layer by layer as a burial place. “The Miamisburg area was probably an Adena gathering site,” says Miamisburg Historical Society curator Gary Petticrew. “We don’t know when they started the Miamisburg Mound, but it probably took hundreds of years to reach its zenith.” Pioneer Jacob Lawres purchased acreage containing the mound in 1806 and subsequently sold it to John Treon, who appreciated the mound’s historical and archeological significance. Although most ancient earthworks were leveled to make way for farms, quarries, roads, and factories during the 1800s, Treon and his descendants protected the Miamisburg Mound. In 1920, the Treon family sold it to Dayton industrialist Charles Kettering, who later donated the mound and 37 surrounding acres of parkland to the state historical society. The Civilian Conservation Corps constructed stone steps as a public works project in the 1930s, allowing visitors to ascend from the base to the top of Miamisburg Mound. Significance: Despite an 1869 excavation attempt that likely diminished its height to 65 feet, the Miamisburg Mound remains Ohio’s tallest — and one of the nation’s largest — conical earthworks. With 116 steps leading to an observation platform at its summit, the mound also is famous for its panoramic views of the Great Miami River Valley. Currently: The Ohio History Connection owns the Miamisburg Mound, the city of Miamisburg maintains Mound Park, and the Miamisburg Historical Society organizes tours and special events. It’s a little-known fact that: Two pioneering archaeologists from Chillicothe — newspaper editor Ephraim Squier and physician Edwin Davis — surveyed the Miamisburg Mound for their landmark scientific research study, Ancient Monuments of the Mississippi Valley. Released in 1848, Ancient Monuments was the Smithsonian Institution’s debut publication, and its very first figure depicts the “Great Mound at Miamisburgh, Ohio.” The Miamisburg Mound, 900 Mound Rd., Miamisburg, OH 45342. For additional information, call 866-580-6508 or 937-859-5000 or visit www.ohiohistory.org/visit/museum-and-site-locator/ miamisburg-mound or www.historicalmiamisburg.org. BUILT STRONGER. LOOKS BETTER. LASTS LONGER. is simple: our materials, our people and a warranty that beats all others. Go Online or Call for FREE DVD & Info Kit! View the entire line of BCS Two-Wheel Tractors at www.bcsamerica.com. any of us gardeners have our vegetable favorites, but truth be told, I’m a bit biased when it comes to broccoli. Not only do its flowers attract beneficial insects, but its culinary versatility and ease of growing make this cool-season favorite one of the most desirable vegetables to grow in the kitchen garden. When grown in the cool weather of spring or fall, the result is a sweeter-tasting head with gourmet flavor. Growing broccoli with sweet, tender, tasty heads is all about getting plants off to a good start, keeping them content, and heeding the signs. The need for speed — One of the best-kept secrets to growing a prime head of broccoli is to grow it fast. Any setbacks that slow down the plant’s growth will result in inferior-tasting heads. Transplants are key for early-spring plantings. Set out four- to six-week-old hardened-off starts in the ground about four weeks before your last spring frost (young seedlings can withstand a light frost, but be sure to cover them if a heavy frost is expected). For fall-harvested crops, seeds sown directly into the ground in July to early August may produce more vigorous plants. Another way to speed things along is with the right amount of sun, soil, and water. Choose a sunny location with at least five hours of daily sun. Moist but well-draining soil rich in organic matter is best, with a soil pH between 6.0 and 6.8 and soil temperatures between 55 and 75 degrees. Deep, consistent moisture is key — lack of adequate moisture can result in premature, poor-quality heads. Mulch helps to maintain soil moisture, moderate soil temperatures, and keep roots cool. Happy plants make for tasty heads — Broccoli is a moderately heavy feeder, so keep plants well-fed by digging in a 2- to 4-inch layer of compost or a thin layer of rotted manure before planting. Work in about a half shovelful of either aged manure or compost or mix in 1/4 cup (per plant) of complete, nitrogen-rich organic fertilizer. If your soil fertility needs a boost, you may also need to side-dress plants with additional compost, rotted manure, or other nitrogen-rich fertilizer, such as fish meal. Start with a light side dressing when the central head is about an inch across. More may be needed once the central main head has been cut. Heed the harvest signs — All your efforts to grow broccoli with great taste will be in vain if you miss the signs on when to harvest the head. For best flavor, harvest when the unopened flower buds are just starting to swell, but before they begin to yellow. Wait too long and the stalks will become tough, with stronger-tasting heads. Harvest heads in the cool of the morning before the heat sets in the plant. Cut the central stalk at a 45-degree angle, about 5 to 8 inches below the head. Doing so will encourage side-shoot production and increase plant yield. Harvesting these side shoots regularly will encourage continued production. KRIS WETHERBEE is a master gardener from Oregon. AFTER • We clean, restore & permanently preserve your product. • Prevents wood from rotting, decaying and further damage from moisture. • Repels mold, mildew & fungus growth. • Prevents concrete from pitting, flaking, dusting and scaling. • Prevents salt & alkali damage. • Backed by technology. Ground rules •	Entrants must be electric cooperative members or residents of an electric cooperative household. Does your family do “meatless Mondays” or something similar? Are you a full-time vegetarian, or maybe just an occasional one? For our 2019 Ohio Cooperative Living reader recipe contest, we’re looking for the best meatless main dish recipe in Ohio. Whether it’s extra hearty or more on the lighter side, send us your best! The grand-prize winner will receive an Ohio-made KitchenAid stand mixer. •	To enter, write down your recipe, including all ingredients and measurements, directions, and number of servings. Then tell us the basic story behind your recipe — when, why, or how YOU do meatless. Is your recipe a family tradition, passed down through generations? Or did you make it up one day out of thin air? A good back story can never hurt! •	Submissions may be an original recipe or one adapted from an existing recipe published elsewhere, with at least three distinct changes from the published version. •	On each recipe, include your name and address, a phone number and email address where you can be contacted, and the name of your electric cooperative. •	Entries should be submitted by email to memberinteract@ohioec. org, or sent to Catherine Murray, care of Ohio Cooperative Living, 6677 Busch Blvd., Columbus, OH 43229. •	Limit of three recipes per entrant. Two runners-up will receive consolation gifts. •	Contest winners will be announced in the September edition of Ohio Cooperative Living. High in fiber and vitamin-rich, mushrooms are a healthy and versatile way to enhance any meal. uernsey-Muskingum Electric Cooperative (GMEC) serves 17,091 consumer-members in east-central Ohio. The unglaciated terrain doesn’t lend itself to wide swaths of farmland, but the hills make for fine pasturelands for cattle raising, and poultry barns fit nicely in the valleys. Because it’s situated in the midst of the Utica Shale, the oil and gas industry is a strong economic driver for the region. Avon calling! GMEC’s largest consumer-member, in terms of electricity use, is the Avon distribution center in Zanesville. Around 2.8 million Avon products are handled in this nearly 600,000-square-foot facility every day. Proud heritage Astronaut and Senator John Glenn and his wife, Annie, grew up in the area and attended nearby Muskingum University. The John and Annie Glenn Museum in New Concord offers tours that enlighten visitors about the statesman’s life and career. The great outdoors The area has much to offer for outdoorsmen and women. Hunting is a popular pastime in this area of the state, and an abundance of state-owned and privately run spaces in the area served by GMEC means there’s no lack of opportunities for getting back to nature. One of GMEC’s best-known consumer-members, The Wilds is a 10,000-acre conservation and education center operated by the Columbus Zoo and Aquarium. Visitors ride in open-air vehicles through the habitats of wild creatures, including rhinos, zebras, giraffes, and ostriches. Wild animals aren’t always friends to electrical distribution, though. GMEC once had to help the facility safely relocate ospreys that thought the tops of electrical poles were a good place to build their massive nests. GMEC also powers Ohio’s largest state park. Hiking, fishing, golfing, a public beach, educational programs led by a naturalist, and more are available within the 17,229 acres of Salt Fork State Park. Fully equipped cabins are available to rent, as are accommodations with plenty of amenities at the lodge. Most recently, the state opened the Jesse Owens State Park and Wildlife Area, adding 5,735 acres of recreational land to the region, with a promise to expand to over 13,000 acres. Deerassic Park Education Center holds programs and events designed for the whole family to learn about and enjoy the outdoors. A herd of 30 deer call the property their home. Guernsey-Muskingum Electric Cooperative hosts a family fun day there every year, providing food and activities for members and their families. and apprenticeships, it takes internal fortitude and a missionoriented outlook to be a good lineman. In fact, this serviceoriented mentality is a hallmark characteristic of linemen. The job requires linemen to set aside their personal priorities to better serve their local community. To perform their jobs successfully, linemen depend on their years of training, experience, and each other to get the job done safely. Equally important is their reliance on a strong support system at home. A lineman’s family understands and supports their loved one’s commitment to the greater community during severe storms and power outages. This means in times of prolonged outages, the family and their lineman may have minimal communication and not see each other for several days. Without strong family support and understanding, this challenging job would be all the more difficult. Community commitment In northeast Ohio and across the country, electric co-op linemen’s mission-focused mentality of helping others often extends beyond their commitment to their work at the co-op. Linemen are often familiar figures in the community. They can be found coaching youth sports teams, volunteering for local charities, and serving on local advisory boards. Thank you Monday, April 8, is Lineman Appreciation Day. Given the dedication of Carroll Electric’s linemen, both on and off the job, I encourage you to take a moment and acknowledge the many contributions they make to our local community. And if you see their family members in the grocery store or out and about in the town, please offer them a thank you as well. Youth Tour participants and scholarship recipients recognized Youth Tour Two students were selected to represent Carroll Electric at the Washington, D.C., Rural Electric Youth Tour June 14 to 20. Youth Tour teaches students about the rural electric utility and gives students a firsthand look at the activities of our government in the nation’s capital. Students have the chance to meet and talk to congressional leaders from Ohio at the U.S. Capitol and see the sights of D.C. Youth Tour is an annual contest sponsored by Ohio’s Electric Cooperatives and Carroll Electric. Children of Members Scholarship Carroll Electric is proud to announce the winners of this year’s Children of Members Scholarships. A total of six $1,000 scholarships were awarded to graduating high school seniors whose parents or guardians are Carroll Electric members. The Children of Members Scholarship competition is an annual contest that encourages Ohio’s rural youth to further their education and provides them an opportunity to become more aware of careers in the rural electric program. One four five four zero zero. *Taylor was chosen to represent Carroll Electric at Ohio’s Electric Cooperatives Children of Members statewide scholarship competition in April. *Employees and trustees were recognized for their years of service during the Carroll Electric Christmas luncheon held in December 2018. Did you know? One Ohio farm’s waste is your co-op’s electricity source Ohio electric cooperatives derive up to 3.85 MW of electricity from three agricultural biogas projects in Ohio. The farms direct manure to units called anaerobic biodigesters, which capture methane gas produced by bacteria in the manure and use the methane to turn turbines that generate electricity. Carroll Electric’s power supply cooperative, Buckeye Power, purchases the excess generation from these anaerobic digester systems and flows the power onto the grid via interconnections with Midwest Electric in west-central Ohio and North Western Electric Cooperative and Paulding Putnam Electric Cooperative in northwest Ohio. Using anaerobic digesters is a win-win-win: for the environment, by preventing the methane gas from emitting into the atmosphere; for farms, by diverting waste and creating an electricity source; and for Ohio’s co-ops and their consumers, who benefit from having a variety of ways to produce electricity. Our office will be closed on April 19 to recognize Good Friday. We wish all of our consumer-members a happy Easter! Check the Carroll Electric local pages of this magazine for the hidden account number. Somewhere in this section is an account number spelled out. If this number matches your account number, call the co-op office to claim your credit. You must call by the end of the month in which your account number appears. policies contain benefits, reductions, limitations, and exclusions to include a reduction in death benefits during the first two years of policy ownership. In NY, during the first two years, 110% of premiums will be paid. Whole Life Insurance is underwritten by United of Omaha Life Insurance Company, 3300 Mutual of Omaha Plaza, Omaha, NE 68175 which is licensed nationwide except NY. Life insurance policies issued in NY are underwritten by Companion Life Insurance Company, Hauppauge, NY 11788. Each company is responsible for its own financial and contractual obligations. Not available in all states. Benefit amounts vary by state. Policy Form ICC11L059P or state equivalent (7780L-0505 in FL, 828Y-0505 in NY). *Ages 50 to 75 in NY. **In FL policy is renewable until age 121. 452747 ***All benefits paid would be less any outstanding loan. hen Vince Slusarz and Matt Earley teamed up to open Gotta Groove Records in Cleveland, a casual music fan might have wondered if they were out of their minds. In 2009, the facility was one of the first new record-pressing plants to open in decades — long after sales of vinyl LPs had been eclipsed by CDs, downloads, and musicstreaming services. Slusarz had retired and was interested in starting his own company — one that would create manufacturing jobs in the region. He was a longtime fan of vinyl and took note when his college-age daughter started buying new vinyl records. “I looked at the statistics and saw that vinyl sales were creeping up, and I wondered if there could be a potential business in it,” Slusarz says. Above: Gotta Groove owner Vince Slusarz displays raw vinyl (top) as well as a lacquer disc used to create the metal record pressing plates. Opposite, a newly pressed record comes off of the stamper. Below, there’s just something about playing a record on a turntable that streaming can’t match. Sounds of success Gotta Groove almost immediately attracted clients because of the dearth of pressing plants in the U.S. at the time (there are now around 30), but Slusarz has since grown the business by targeting underserved clientele. While roughly 20 percent of Gotta Groove’s business comes from major labels, the company primarily fills a niche by providing one-stopshop record production and distribution services for smaller labels and independent artists. Slusarz’s bet on vinyl has paid off. The RIAA reports that vinyl sales rose from $66 million in 2009 to $395 million in 2017. Gotta Groove now presses 1 million records or more each year — everything from a reissue of Fleetwood Mac’s Greatest Hits to local indie releases. They also press records for a number of Ohio-based labels, including Rockathon Records, home to Dayton-based indie rock veterans Guided by Voices. “There’s a desire among people to own something tactile and physical, and there’s some backlash to digital music, too,” Slusarz says. “For younger people, there’s also a social aspect to vinyl. No one says, ‘Come over to my house and listen to streaming music.’ But you can invite people over to put on records, and they can thumb through your albums while they listen. It’s a pleasurable experience.” Gotta Groove Records is located at 3615 Superior Ave., Suite #4201A, Cleveland, OH 44114. Visitors can tour the plant — just call ahead at 800-295-0171. Visit their website at www.gottagrooverecords.com. Gotta Groove employees Heath Gmucs (closest to the press) and Kevin McCann inspect one of the company’s record presses (bottom). Once the record is pressed, the excess vinyl is trimmed and the finished record is dropped onto a stack (top). Cannot be used with other discounts or prior purchases. Original coupon must be presented. Valid through 7/25/19 while supplies last. Limit 1 FREE GIFT per customer per day. Limit 1 coupon per customer per day. Save 20% on any 1 item purchased. *Cannot be used with other discount, coupon or any of the following items or brands: Inside Track Club membership, Extended Service Plan, gift card, open box item, 3 day Parking Lot Sale item, compressors, floor jacks, safes, saw mills, storage cabinets, chests or carts, trailers, trencher/backhoe, welders, Admiral, Ames, Bauer, Cobra, CoverPro, Daytona, Diamondback, Earthquake, Fischer, Hercules, Icon, Jupiter, Lynxx, Poulan, Predator, Tailgator, Viking, Vulcan, Zurich. Not valid on prior purchases. Non-transferable. Original coupon must be presented. Valid through 7/25/19. *Original coupon only. No use on prior purchases after 30 days from original purchase or without original receipt. Valid through 7/25/19. • Boom extends from 36-1/4" to 50-1/4" • Crane height adjusts from 82" to 94"
RAMPING it up  fter a fortuitous find, South A Central Power Company members specialize in aromatic agriculture. “It wasn’t until 2008, while reading an issue of Bon Appetit magazine, that I discovered the plants were ramps,” Kunkler says. “I learned that some people were paying big money for them — $13 per pound on the East Coast.” Also known as spring onions, wild leek, wood leek, or wild garlic, ramps grow wild throughout much of the eastern U.S. and north into eastern Canada. According to the Kunklers, the epicenter of ramps in North America is West Virginia. Huntington’s annual April ramp party — April 27 this year — is known as Stink Fest. Ramps smell and taste much like a crisp, garlicky onion. The Kunklers prefer them minced into sauces or chopped up and cooked with rice and a little butter. Sliced and fried with potatoes and eggs is also tasty. During spring, the entire plant is edible, including bulb, stem, and slim leaves that measure about 10 to 12 inches long. David Kunkler, left, shows off part of his harvest from the family ramp-farming operation in Perry County. Kunkler and his wife, Jane, came across acres of ramps growing on their property shortly after they bought it in 1976, and they have turned the find into a profitable mail-order business. His wife disagrees, however. “I think that ramps have always grown here naturally, as our land is too steep and rocky for farming. As a result, it has never been plowed or even timbered,” she says. Jane and David first began selling their ramps to a market in Columbus’s Short North District, as well as to a few highend restaurants in central Ohio. Today, they sell mainly online, shipping 500 to 600 pounds of ramps annually to gourmets in every state except Alaska and Hawaii. “Our local postmistress in Somerset tells us she knows exactly when one of our boxes arrives for shipping,” Jane Kunkler says. “She can tell by the smell.” For more information on the Kunklers’ ramp business or to order, visit www.ledgerockfarms.com. t’s no secret that Lake Erie’s recent algae blooms have a small army of scientists and conservationists working nonstop to remedy its troubles. But a little-known faction has been feeding valuable data to those problemsolvers: charter captains. Now, more than a dozen captains provide a steady seasonlong stream of info to scientists. “We give the exact location we were when we sampled and offer the water temperature, depth, clarity, and also wind conditions and anything else that’s happening at the time,” Spangler says. Ohio Wildlife Council member George Klein takes a break from fishing to check out the most recent data compiled by charter captains. “During the past two seasons, we’ve been sport fishing out on the lake with Ohio Division of Wildlife, and we implant walleye with radio telemetry transmitters,” says Paul Pacholski, LECBA president. Pacholski works nearly full time on education, public relations, and data collecting for the group. “We’ve recently worked with Wayne State University on an invasive species study and Heidelberg University on a Maumee River water flow study,” he says. In fact, Pacholski says he and other charter captains have worked with just about every university in the region on not only Lake Erie-related research projects, but also inland marshes and estuaries. When asked if charter captains weren’t supposed to be out on the lake during the algae crisis, Pacholski laughs. “My mom wrote me a note that said I can go anywhere I want,” he brags. Justin Chaffin, research coordinator at Stone Lab, Ohio State University’s island science spot (situated on tiny Gibraltar Island at Put-in-Bay), says the partnership works well. “We train the captains to collect the samples, but also to talk about the data and issues with their customers, and that translates into a really great outreach project.” Chaffin says info from charter captains gets compared to bona fide, professional data — and it’s solid. “It’s surprising how accurate the charter captain data set is,” he says. “The added benefit is they have opportunity to talk with the public about all the issues and disseminate accurate information.” Captains have their fishy fingers into more than just algae blooms and radio telemetry. Another Stone Lab study determines how water turbidity and algae affect the vision of both walleye and their favorite food, emerald shiners. “We’re learning some really cool things about which lure colors that walleye prefer under different conditions,” says Suzanne Gray, assistant professor of aquatic physiological ecology at Ohio State. Spoiler alert: “When there’s an algae bloom, I believe having black components in the lure is beneficial,” she says. While Gray and staff have been working with fish in the laboratory, captains are doing the same on the lake via a cellphone app developed by graduate student Chelsey Nieman. The app allows captains to capture and send on-the-water data — and photos — back to Stone Lab. The photos provide information as detailed as a fish’s eye size, exact location of a catch, and an image of water at the site, all of which is meshed with satellite imagery and info from scientific buoys and weather stations. “They have a vinyl sheet with a ruler on it,” Gray says. “There’s a color wheel and a place to put the lure that caught the fish. They place fish on the ruler, the lure in the box, and take a photo off the side of the boat. Some of the charter captains love to email Chelsey with their stories. I think it’s great.” This summer, Gray, staff, and students will fish with captains in controlled angling studies. “So far, they’re only telling us what’s successful, not all the lures they switched out, all the ones that didn’t catch fish. This is the first time I’ve tapped into the expertise of people who are actually out there, the ones on the water. They know the lake and they know the fish, and that’s been truly awesome.” JAMES PROFFITT is a freelance writer from Marblehead. The doctor evaluated the high priced hearing aids on the market, broke them down to their base components, and then created his own affordable version, called the MDHearingAid, for less than $200. Chicago – A local board-certiﬁed physician has done it once again with his newest invention of a medical-grade, aﬀordable hearing aid. This new hearing aid is packed with all the features of traditional hearing aids found at clinics for a mere fraction of the cost. Now most people with hearing loss are able to enjoy crystal clear, natural sound — in a crowd, on the phone, in the wind — without suffering through “whistling” and annoying background noise. Behind-the-ear for a nearly invisible proﬁle Accommodates Mild, Moderate, and Moderately-Severe hearing loss Ampliﬁes the critical frequencies of the human voice, without amplifying background sounds Multiple sized ear domes allow for the perfect size 2-Programs for customized hearing. This sleek, fully programmed, light-weight, hearing aid is the outgrowth of the technology revolution that is changing our world. While demand for new technology caused most prices to plunge (consider DVD players and computers, which originally sold for thousands of dollars and today can be purchased for less), the cost of a medical-grade hearing aid remains out of reach. The doctor knew that many of his patients would beneﬁt but couldn’t aﬀord the expense for these new hearing aids. Generally they are not covered by Medicare and most private health insurance plans. Decrease background noise and choose the best program for your hearing loss. Using advanced technology, the MDHearingAid adjusts to your listening environment — prioritizing speech and de-emphasizing background noise. Experience all of the sounds you’ve been missing at a price you can afford. This doctor designed and approved hearing aid comes with a full year’s supply of long-life batteries. It delivers crisp, clear sound all day long and the soft flexible ear domes are so comfortable you won’t realize you’re wearing them. Can a Hearing Aid Delay or Prevent Alzheimer’s & Dementia? A study by the National Institute on Aging suggests older individuals with hearing loss are signiﬁcantly more likely to develop Alzheimer’s and dementia over time than those who retain their hearing. They suggest that an intervention — such as a hearing aid — could delay or prevent this by improving hearing! Try It Yourself at Home 45-Day Risk-Free Trial Of course, hearing is believing and we invite you to try it for yourself with our RISK-FREE 45-day home trial. If you are not completely satisﬁed, simply return it within that time period for a full refund of your purchase price. EASY TO USE—tows behind your ATV or riding mower, filling in potholes and ruts. PRECISE CONTROL of grading depth is adjustable from your driver’s seat. SAVES YOU MONEY—loosens and redistributes existing material, saving you from purchasing new gravel or stone. AMAZINGLY DURABLE carbide teeth last 10X longer than steel on ordinary box scrapers. and pulpit. For Jones, his painting shows Americans as those who “shall never be destroyed.” At age 13, Herman Wessel went to the Cincinnati Art Academy, beginning a career that spanned the world. His two 7-foot murals in the Springfield post office depict the city’s early industries. Printing in Springfield and Manufacture of Farm Implements are in the post office’s original section, which is now a museum. The detailed, art deco postal windows and the period artifacts round out the artistic touches in the room. Like the Springfield post office, other post offices have changed. The original post office in Fairborn has been turned into a library. Fortunately, the 1941 Wright Brothers in Ohio mural by Henry Simon was moved to the town’s new post office. In 1940, when Lloyd R. Ney painted his New London Facets in the New London post office, town resident Vaughn Neel was 11 years old. Later, as the post office’s window clerk, Neel created a binder of mural-related correspondence and articles. “This is one of three murals like it in the U.S.,” recalls Neel, who at 88, recently retired as treasurer of the New London Historical Society. Ney pushed for his abstract design to be accepted by the FAP, which leaned toward realistic scenes. Recently cleaned, the mural showcases the bright colors of Ney’s vision, and the post office still has the binder that Neel created. Ohio native Richard Zoellner has murals in two post offices. Tobacco Harvest, painted in 1938 for the Georgetown post office, shows farmers in a tobacco field with Georgetown’s prominent buildings in the background. His smaller 1937 murals in the Portsmouth post office, Coal Barges and Waterfront, depict that town’s river history. Also at the Portsmouth post office, town native and artist Clarence H. Carter’s four murals, Characteristic Local Scenes in Portsmouth, cover three walls. Although Carter’s visual story of Portsmouth’s riverboat, farming, and factory history is stunning, for longtime resident Robert Mohl, the mural of the town’s 1937 flood is most remarkable. “See how the sacks were filled to try to stop the water,” he says, pointing to the frantic scene. For Mohl, 80, the murals opened his mind when he was a child. “When you are a kid, you are down so low — the murals are up so high. It’s staggering to realize that the world isn’t billboards once you appreciate the world of handmade, of brushes, colors, and ideas.” JAMIE RHEIN is a freelance writer from Columbus. Opposite page: Richard Zoellner’s Tobacco Harvest adorns the wall at the post office in Georgetown; Manufacture of Farm Implements (above) is one of two murals Herman Wessel created for the post office at Springfield; right, top to bottom: Country Dance in the Ada post office imagines life in the 1800s; Lloyd R. Ney had to lobby the Federal Art Project to accept his abstract design for the New London post office; Clarence H. Carter painted four murals that cover three walls at the post office in Portsmouth. MARKETPLACE Tiny House Nation builder! Fast-Growing Trees For windbreak, screen and shade – some grow up to 6 feet per year! RETIREMENT SALE 30% off everything in stock! 10 lb. bag treats up to 4,000 sq.ft. $91.00. 50 lb. bag treats up to 20,000 sq.ft. $344.00. FREE SHIPPING! Certified and approved for use by state agencies. State permit may be required. Registered with the Federal E.P.A. APR. 13 – Bucyrus Model Railroad Association Train Show and Swap Meet, Crawford Co. Fgds., 610 Whetstone St., Bucyrus, 10 a.m.–4 p.m. $5, under 12 free. Club Room will be open with operating layouts for all to enjoy. Exhibit tables available for selling, trading, and swapping. 866-562-0720 or 419-462-5035. APR. 13 – CMP Monthly Air Rifle and Air Pistol Match, 1000 Lawrence Dr., Port Clinton. Free admission and parking. Competitions feature a Junior Air Rifle 3x20 and 3x10; 60 Shots Air Rifle and Air Pistol match; and 20shot Novice Prone match. Rental equipment is available for a small fee. 419-635-2141 (Brad Donoho), lsherman@ THROUGH APR. 28 – “Expanded Views: Native thecmp.org, or www.thecmp.org. American Art in Focus,” Toledo Museum of Art, 2445 APR. 20 – Hayes Easter Egg Roll, Spiegel Monroe St., Toledo. Both historical and contemporary Grove, Rutherford B. Hayes Presidential Library and Native American art is featured, including new acquisitions Museums, Fremont, 2–3:30 p.m. Admission is three and a large-scale work by James Lavadour. 419-255-8000 hard-boiled colored eggs. For kids age 3–10. Prizes, or www.toledomuseum.org. games, crafts, and visits with the Easter Bunny. 419APR. 5, 12, 19, 26; MAY 3, 10 – First Fridays, 332-2081 or www.rbhayes.org. downtown Sidney. Participating shops and restaurants APR. 20 – Easter Egg Hunt, Northwest Ohio stay open later, and many offer a First Friday discount. Railroad Preservation Inc., 12505 Co. Rd. 99, Findlay. 937-658-6945 or www.sidneyalive.org. Adults, $3; children 12 and under, $2 (includes a train ride). APR. 7 – Toledo Doll, Bear, and Toy Show, Lucas Continuous egg hunt with multiple age divisions from Co. Fgds., Maumee Rec. Ctr., 2901 Key St., Maumee, 10 10 a.m. to 2 p.m. Quarter-scale train rides continue until a.m.–4 p.m., early admission 8:30 a.m. Admission $6; 4 p.m. 419-423-2995, www.nworrp.org, or www. early bird, $20. Free parking. Antique, vintage, artist, and facebook.com/nworrp. modern dolls and bears, as well as accessories, antique APR. 21 – Easter Egg Hunt on the Square, 109 S. toys, vintage holiday items, appraisals, and on-site doll Ohio Ave., Sidney. The hunt starts promptly at 11 a.m. Four stringing. 734-282-0152, sandy4085@hotmail.com. or groups: ages 1–2; 3–5; 6–8; and 9–11. 937-658-6945 or www.toledodollshow.com. www.sidneyalive.org. APR. 11 – Through the Drinking Glass Tasting APR. 22, 24 – Hidden Spaces, Secret Places and Pairing Event: Ohio Wines, 109 S. Ohio Ave., Tour, downtown Sidney. Tour starts at 109 S. Ohio Ave. Sidney. Time to be determined. 937-658-6945 or www. Tickets available on website; space is limited. 937-658sidneyalive.org. 6945 or www.sidneyalive.org. APR. 12–13 – Home Sweet Home: A VintageAPR. 27 – Chocolate and Wine Walk, 5495 Liberty Inspired Market, Allen Co. Fgds., 2750 Harding Hwy., Ave., Vermilion, 11 a.m.–5 p.m. $20. Take a stroll through Lima, Fri. 5–8 p.m., Sat. 9 a.m.–4 p.m. $5, under 12 free. downtown Vermilion while sampling chocolate treats and/ Free swag bags to the first 50 guests. Vintage, rustic, or wine as you visit the quaint shops. 440-967-4477 or primitive, shabby chic, antiques, repurposed, and upcycled http://vermilionchamber.net. items. Food trucks on site. 419-230-1756 or http:// APR. 27–28 – The Fantastic Tiffin Flea Market, homesweethomevintagemarket.com. Seneca Co. Fgds., 100 Hopewell Ave., Tiffin, Sat. 9 APR. 12–14 – Southern Gospel Expo, Trinity a.m.–4 p.m., Sun. 9 a.m.–3 p.m. Free admission and Friends Church, 605 N. Franklin St., Van Wert, Fri. 5 p.m., parking; handicap accessible. 250 to 400 dealers per Sat. 4 p.m., Sun. 6:30 (doors open at 4 p.m.). Free. Over show. 419-447- 9613, tiffinfleamarket@gmail.com, or 25 gospel groups from around the country. Food court www.tiffinfleamarket.com. available each night. 419-238-2788 or www.trinityvw.com. APR. 27–28 – Ghost Town Spring Crafts and APR. 12–14 – Zombie Prom: Atomic Edition, Antiques Festival, 10630 Co. Rd. 40, Findlay, Sat. 9 McDonald’s Youth Theatre, 991 N. Shore Dr., Lima, Fri./ a.m.–5 p.m., Sun. 10 a.m.–4 p.m. www.facebook.com/ Sat. 7:30 p.m., Sun. 2 p.m. A girl-loves-ghoul rock ‘n’ roll Ghost-Town-Findlay-Ohio-1525098627787387. off-Broadway musical set in the 1950s. www.amiltellers.org. the country music program left the radio studio to become the second-oldest country broadcast stage show in history. 304-243-4470 or www.capitoltheatrewheeling.com. APR. 21 – Easter Day Buffet, North Bend State Park, 202 North Bend Park Rd., Cairo, 11 a.m.–3 p.m. $23.95. Reservations recommended. Easter egg hunt at 2 p.m. 304-643-2931 or www.northbendsp.com. MAY 1–OCT. 27 – Blennerhassett Voyage Package, North Bend State Park, 202 North Bend Park Rd., Cairo. $130, includes one night of lodging at North Bend, sternwheeler ride to and from Blennerhassett Island, wagon ride tour of the island, and tour of Blennerhassett Mansion. 304-643-2931, www.northbendsp.com, or www. blennerhassettislandsatatepark.com. PLEASE NOTE: Ohio Cooperative Living strives for accuracy but urges readers to confirm dates and times before traveling long distances to events. Submit listings AT LEAST 90 DAYS prior to the event to Ohio Cooperative Living, 6677 Busch Blvd., Columbus, OH 43229 or events@ ohioec.org. 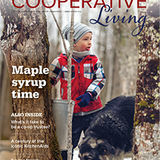 Ohio Cooperative Living will not publish listings that don’t include a complete address or a number/website for more information. Stop by the Visitor Center at 120 S. 3rd St. to get a map. 740-283-1787 or www.visitsteubenville.com/events. APR. 25–28 – Geauga County Maple Festival, Historic Chardon Square, Chardon. Arts and crafts, lumberjack competition, beard and mustache contest, bathtub races, pageants, and other events. Enjoy allyou-can-eat Pancakes in the Park every day, 8 a.m.–2 p.m.: adults $8, under 6 free. 440-286-3007 or www. maplefestival.com. APR. 26–27 – 55th Annual International Watch Fob Association Show and Sale, Lakeside Sand and Gravel, 3540 Frost Rd., Mantua, Fri. 9 a.m.–8 p.m., Sat. 9 a.m.–5 p.m. Free admission. The world’s largest watch fob, construction memorabilia, and toy show. Free refreshments. 440-816-1882 or chuck@ dhsdiecast.com, www.watchfob.com, or www.facebook. com/iwfai. APR. 27 – Medina Spring Avant-Garde Art and Craft Show, Medina Community Rec. Ctr., 885 Weymouth Rd., Medina, 10 a.m.–5 p.m. $3, under 12 free. Join us at our newest show launching this spring! Feature artists and crafters selling their original handmade items. www.avantgardeshows.com. APR. 27 –18th Annual Lakeside Sand and Gravel Open House and Antique Equipment Show, 3450 Frost Rd., Mantua, 9 a.m.–5 p.m. Antique construction and mining demos. Bus tours of the company’s sand and gravel operations. Lunch provided with donation. 330-274-2569 or www. lakesidesandgravel.com. APR. 27–MAY 11 – Annual Spring Art Show and Sale, Eastern Gateway Community College, 4000 Sunset Blvd., Steubenville. Sponsored by Steubenville Art Association. 740-264-2959. MAY 3–4 – Dandelion May Fest, Breitenbach Wine Cellars, 5934 Old Rte. 39 NW, Dover, Fri. noon–7 p.m., Sat. 9 a.m.–7 p.m. Dandelion food and wine tastings, dandelion sangria, dandelion picking contest and jelly-making, entertainment, and vendor fair. 5K run. 330-343-3603 or www.breitenbachwine.com/events/ dandelion-festival. MAY 4–5 – Ohio Civil War Show and Artillery Show, Richland Co. Fgds., 750 N Home Rd., Mansfield, Sat. 9 a.m.–5 p.m., Sun. 9 a.m.–3 p.m. $7, under 12 free. Free parking. Military items, relics, and memorabilia to buy, sell, or trade. Cannon firing and WWII small arms demos, Civil War hospital scenario and encampments, and much more. www.ohiocivilwarshow.com. MAY 4–5 – Model Train Days, Painesville Railroad Museum, 475 Railroad St., Painesville, 10 a.m.–5 p.m. $5, C. (3–12) $3, Family $12. Operating layouts in N, HO, and S scale, and O and G gauge. Flea market on grounds. Food and drinks available. 440-417-6746 or www. painesvillerailroadmuseum.org. MAY 5 – Harrison Career Ctr. FFA Tractor, Truck, Engine, and Car Show, Harrison Co. Fgds., 550 Grant St., Cadiz, 11 a.m.–4 p.m., registration starting around 9:30 a.m. Donation for admission. 330-440-5578, HCCFFA@yahoo.com, or www.facebook.com/HCCFFA. MAY 11 – Harrison Coal & Reclamation Historical Park Dinner/Auction, Wallace Lodge, Sally Buffalo Park, 100 College Way (43000 Industrial Park Rd. ), Cadiz. $18. Doors open at 5 p.m., dinner at 6 p.m., followed by speaker and auction. For reservations or to donate items: 740-391-4135, 740-942-3895, info@ hcrhp.org, www.hcrhp.org, or www.facebook.com/ HCRHP. MAY 11 – German Maifest, Historic Zoar Village, 198 Main St., Zoar, 10 a.m – 5 p.m. Free. Traditional German food and drink, music, dancing, games, art projects, and a Maypole. Grand opening of the “Sense of Zoar” art exhibit at the Bimeler House. 800-262-6195 or www. historiczoarvillage.com/events. MAY 11 – Avon Spring Avant-Garde Art and Craft Show, Emerald Event Ctr., 33040 Just Imagine Dr., Avon, 10 a.m.–5 p.m. $3, under 12 free. www. avantgardeshows.com.​ MAY 11 – Zoar Plant Sale, Zoar Garden, 168 W. 4th St., Zoar. 8 a.m.–4 p.m. Annuals, perennials, hanging baskets, vegetables, shade plants, and shrubs. www. historiczoarvillage.com/events. tickets, and raffle. Lunch at 12:30 with the Style Show to begin shortly afterward. 740-439-8151 or http:// seormc.org. APR. 13 – Patty Griffin, Stuart’s Opera House, 52 Public Square, Nelsonville, 8 p.m. $43–$58. 740-7531924 or www.stuartsoperahouse.org. APR. 14 – Ben-Hur, Athena Grand, 1008 E. State St., Athens, 6 p.m. $12.50. 60th anniversary of this film classic. 740-593-8800 or www.athenagrand.com. APR. 20 – Earth Gathering Festival, Pump House Ctr. for the Arts, 1 Enderlin Circle, Chillicothe, 11 a.m.–6 THROUGH DEC. – Athens Farmers Market, p.m. Free admission. Juried art festival with an Earth 1000 E. State St., Athens, Wed. 9 a.m.–1 p.m., Sat., Day theme. Affordable handmade art and great music 9 a.m.–noon. Farmers, orchardists, specialty food from local and regional artists. 740-772-5783 or http:// producers, bakers, horticulturalists, cheese makers, and visitchillicotheohio.com. more. 740-593-6763 or www.athensfarmersmarket.org. APR. 20 – Easter Egg Hunt, Deerassic Park APR. 12–14 – Annual Wildflower Pilgrimage, Education Ctr., Cambridge, 11 a.m.–1 p.m. Free. Youth Highlands Nature Sanctuary, 7660 Cave Rd., Bainbridge. under 12 hunt eggs for tickets and prizes. 740-435-3335 Join us for a weekend of guided hikes, delicious meals, or www.deerassic.com. and special talks from our guest speakers. Our 2019 APR. 25–28 – Pike County Dogwood theme is “Signature Animals of the Great Eastern Festival, Main St., Piketon. Daily entertainment, Forest.” Space is limited and registration is required. food, contests, rides, parade, and more. www. 937-365-1935 or www.arcofapplachia.org/annualpikecountydogwoodfestival.com. wildflower-pilgrimage. APR. 27–28 – Lucasville Trade Days, Scioto Co. APR. 13 – 51st Wing 12 Daffodil Luncheon, Fgds., 1193 Fairground Rd., Lucasville. $3, under 13 free; Pritchard Laughlin Civic Ctr., 7033 Glenn Hwy., early bird admission, $4. Free parking on fairground lots. Cambridge. Doors open at 11:30 a.m. Vendors, quilt 937-728-6643 or www.lucasvilletradedays.com. APR. 28 – Spring Hike, Adena Mansion and Gardens, 847 Adena Rd., Chillicothe, noon–4 p.m. Free. Guided woodland hike, limited to the first 30 who register the day of the hike. Two hikes, at noon, and 2 p.m. Children must be accompanied by an adult. http:// visitchillicotheohio.com/event/spring-hike-2. MAY 2–5 – Wild Turkey Festival, 100 E. Main St., McArthur, Thur. 5–11 p.m., Fri./Sat. 11 a.m.–11 p.m., Sun. noon–5 p.m. Carnival rides, games, car show, quilt show. Parade and crowning of the Wild Turkey Festival Queen at 6 p.m. Saturday. 740-591-1118, chriscram59@ gmail.com, or www.wildturkeyfestival.com. MAY 3–5 – Spring Women’s Retreat, Highlands Nature Sanctuary, 7660 Cave Rd., Bainbridge. Enjoy the company of other like-minded women and get back to nature in the way that suits you best. Space is limited. Register at http://arcofappalachia.org/womens-retreat/ or 937-365-1935. MAY 3–SEPT. 27 – Rise and Shine Farmers Market, 2135 Southgate Pkwy., Cambridge, Fridays, 8 a.m.–noon. 740-680-1866. MAY 4 – Spring Fest, Deerassic Park Education Ctr., Cambridge. 740-435-3335 or www.deerassic.com. THROUGH APR. 22 – I-X Indoor Amusement Park, IX Center, One I-X Dr., Cleveland. Annual spring event offers a full day of family fun at a budget-friendly price! Rides, games, food, and attractions, all under one roof. 216-265-2586 or www.ixamusementpark.com. APR. 1–13 – Spring Quilt Show, Historic Fort Steuben Visitor Ctr., 120 S. 3rd St., Steubenville, Mon.–Fri. 10 a.m.–4 p.m., Sat. noon–4 p.m. 740-283-1787 or www. oldfortsteuben.com. APR. 4–6 – Vernal Poolooza Science Conference, Ashland University Convocation Ctr., 638 Jefferson St., Ashland. www.ohwetlands.org/ vernalpoolooza-2019. APR. 13 – Canton Spring Avant-Garde Art and Craft Show, St. George Serbian Ctr., 4667 Applegrove St. NW, North Canton, 10 a.m.–5 p.m. $3, under 12 free. 440-227-8794 or www.avantgardeshows.com. APR. 14 – Black Violin: Classical Boom, Connor Palace, Playhouse Square, 1519 Euclid Ave., Cleveland, 7 p.m. $10–$45. 216-771-4444 or www.playhousesquare. org/events. APR. 19–MAY 12 – Shrek the Musical, Geauga Lyric Theater Guild, 101 Water St., Chardon, Fri./Sat. 7:30 p.m., Sun. 2 p.m. $10–$18. Based on the Oscar-winning film. 440-286-2255 or www.geaugatheater.org. APR. 21–MAY 12 – The Great Steubenville Eggsibition, various locations, Steubenville. Huge handpainted “eggs” offer a downtown scavenger hunt! parking. An upscale market bringing together more than 125 vendors. Farmhouse décor, clothing, candles, jewelry, crafts, live music, and food trucks. 614-296-1621 or find us on Facebook. APR. 13 – Church Basement Ladies: Rise Up, O Men, Marion Palace Theatre, 276 W. Center St., Marion, 2 p.m. $20–$35. Hilarious new national touring musical is the latest addition to the Church Basement Ladies series. 740-383-2101 or www.marionpalace.org. APR. 13 – Midwest Scholastic Rowing Sprints, Dillon Lake, 5265 Dillon Hills Dr,, Nashport. www. midwestscholasticrowing.com. APR. 13–14 – AG Days, presented by Hocking County Farm Bureau, Hocking Co. Fgds., 150 N. Homer Ave. Logan, Sat. 9 a.m.–5 p.m., Sun. 9 a.m.–4 p.m. Historic farming practices, antique tractors, threshing machines and corn sheller, steam-powered sawmill, and hit-and-miss engines. Bluegrass band, kids’ activities. 740-474-6284 or www.ofbf.org. APR. 13, 27, MAY 11 – Nelson T. Gant Homestead Tours, 1845 W. Main St., Zanesville, 11 a.m.–1 p.m. or call for appointment. Officially recognized as an Underground Railroad site. 740-453-0988, 740-3191157, or www.nelsontgantfoundation.org. APR. 26–28 – Mohican Wildlife Weekend: Pick Your Path, various locations in Ashland and Richland counties. Free. A celebration of wildlife habitat, heritage, and natural history. Workshops and demonstrations. 800642-8282 or www.mohicanwildlifeweekend.com. APR. 26–28 – Vintage Market Days, Franklin Co. Fgds., 4951 Northwest Pkwy., Hilliard, Fri./Sat. 10 a.m.–5 p.m., Sun. 10 a.m.–4 p,m. $10 for early buyer, $5 for Sat./ Sun. only, under 13 free. An upscale vintage-inspired indoor/outdoor market featuring original art, antiques, clothing, jewelry, decor, outdoor furnishings, and more. www.vintagemarketdays.com. APR. 27 – Earth Day Celebration, Coshocton County Career Ctr., 23640 Airport Rd., Coshocton, 12–4 p.m. Free. Exhibits and vendors including artisans, organic farmers, community groups, and Native American culture. Explore solar power and green enterprises. Live raptor demos, kids’ activities, entertainment, and food. 740-5026546 or www.cecaware.org. APR. 27 – Ohioana Book Festival, Columbus Metropolitan Main Library, 96 S. Grant, Columbus, 10:30 a.m.–5 p.m. Free. More than 100 Ohio authors gather with readers for a day of panel discussions, readings, a book fair, children’s activities, and more. 614-466-3831 or www. ohioana.org. APR. 27 – Taste of Marysville, Marysville High School Field House, 800 Amrine Rd., Marysville, 5–9 p.m. $10 buys 8 tasting tickets; you choose the vendors. 937-243-5833 or www.tasteofmarysville.com. APR. 28 – Southeastern Ohio Symphony Orchestra Concert, Brown Chapel, College Dr., New Concord, 7 p.m. $15. Season finale of favorites! 740-8268197 or www.seoso.org. APR. 28 – Zane Grey Day, National Road–Zane Grey Museum, 8850 E. Pike, Norwich, 1–4 p.m. An afternoon of fun outdoor activities. www.ohiohistory.org. MAY 3 – Chocolate Hop, Columbus and Center Sts., Pickerington, 6–8 p.m. $5, receive a map of locations around the Olde Village where you will receive a chocolate treat. www.pickeringtonvillage.com. MAY 3 – The Everly Brothers Experience, Marion Palace Theatre, 276 W. Center St., Marion, 7:30 p.m. $15– $28. The Zmed Brothers simulate the sound of the legendary rock ’n’ roll singing duo. 740-383-2101 or www. marionpalace.org. MAY 4–5, 11–12, 18–19, 25–26 – Rock Mill Weekends, Stebelton Park at Rock Mill, 1429 Rockmill Place NW, Lancaster, Sat./Sun. 12–4 p.m. Free. Tour the restored 1824 gristmill. Grinding demos on May 26. 740681-7249 or www.fairfieldcountyparks.org. MAY 4, 11, 18, 25 – Spring Farmers’ Market, Muskingum Co. Fgds., 1300 Pershing Rd., Zanesville, 9 a.m.–12 p.m. www.zanesvillefarmersmarket.org. MAY 11–12 – Midwest Scholastic Rowing Championships, Dillon Lake, 5265 Dillon Hills Dr,, Nashport. www.midwestscholasticrowing.com. APR. 26–28 – Vintage Market Days, Greene Co. Fgds., 120 Fairground Rd., Xenia, Fri./Sat. 10 a.m.–5 p.m., Sun. 10 a.m.–4 p,m. $10 for early buyer, $5 for Sat./Sun. only, under 13 free. An upscale vintage-inspired indoor/ outdoor market featuring original art, antiques, clothing, jewelry, home décor, outdoor furnishings, and more. www.vintagemarketdays.com. MAY 5 – Music at the Mound with Steve Free, Serpent Mound, 3850 OH-73, Peebles, 1 p.m. Free admission; $8 parking fee. http://arcofappalachia. org/steve-free. MAY 10 – Taste of the Arts, Main and Ash Sts., Piqua. An evening of fun, music, and food. Shop, enjoy live music, and sample food from various local restaurants and caterers. 937-773-9355 or www. mainstreetpiqua.com. MAY 10–12 – Appalachian Festival, Coney Island Amusement Park, 6201 Kellogg Ave., Cincinnati, Fri. 9 a.m.–9 p.m., Sat. 10 a.m.–9 p.m., Sun. 10 a.m.–6 p.m. $10, Srs. $5, C. (2–12) $2, under 2 free. Crafts, food, Living History Village, old-time dance, storytelling, and music. www.appalachianfestivalcincinnati.org. At Ohio’s electric cooperatives, we work hard to take care of our neighbors—whether that’s across town or across the globe. Ohio cooperative linemen brought electricity for the ﬁrst time to three remote Guatemalan villages over two trips in two years. We’re helping to light the world, one village at a time.